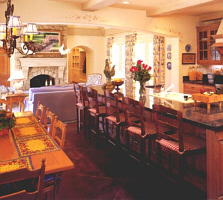 This particular design was done in a hallway accented by a large bank of french doors divided by an eating nook. 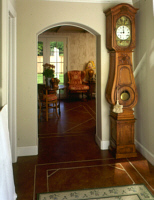 Unlike tile, sawcutting the slab concrete allows for flexibility of design for odd shaped rooms and passageways. The first impression is the best impression. 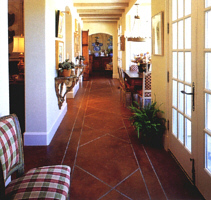 This entry hall is small and benefits tremendously from the unique design of the concrete floor. 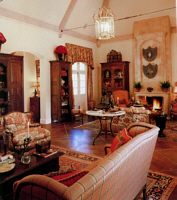 The color is accented with furniture and an area rug. taking full advantage of the angles, the sawcuts accentuate the union of the odd-angled island and the kitchen cabinets. Here, the center island is the focal point of the sawcuts. Each compliments the other. 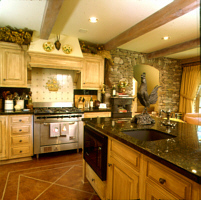 The color chosen accents the custom cabinet work to create a warm and cozy feel. 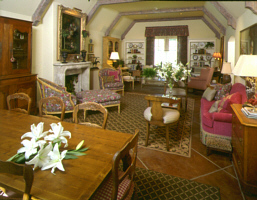 Larger rooms, such as this Great Room, are simply enhanced by larger sawcut designs. This serves as an excellent method for accommodating a large room. 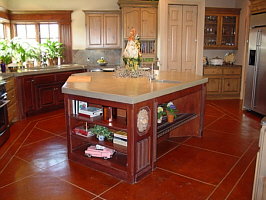 Area rugs and antique furniture are right at home atop the distinctive color or this floor. The sawcuts in this Family Room are thicker to bring out the layout of the design. A floor in a room is just as important as the walls and ceilings. Attention to detail is crucial for a memorable appearance. 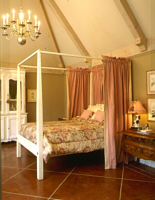 One area of interesting detail is the Master Bedroom. This particular bedroom, complete with it's vaulted ceilings and trim timbers, is gloriously contrasted by the color and design of the stained and scored concrete floor.